WHY BUY YOUR DRY CHEMICAL POWDER EXTINGUISHER FROM LONDON FIRE & SAFE? London Fire & Safe pride ourselves on suppling only good quality fire extinguishers that are Standards Australia approved and are tried and tested in the field. This way you, the customer know that you are getting a quality product from a team that knows what they are doing. We can complete the whole job for you from selection, installation to certification. What is a Dry Chemical Powder Extinguisher you ask? Well they are more commonly known as Powder Fire Extinguishers. Powder Fire Extinguishers can be identified by its color labeling…which is red cylinder with white band as below. Suitable for all paper, textiles, wood, plastics, rubber, petrol, oil, paints LPG, CNG, Acetylene and Electrically charged equipment. Dry Chemical ABE Powder type extinguishers are the most widely used extinguisher. It is also important to remember that when using the Dry Chemical Powder (DCP) or Powder extinguisher, consideration must be made in relation to the location and usage of this product as a fine powder is discharged. They are available in a number of sizes - 1kg, 1.5kg, 2.0kg, 2.5kg, the popular 4.5kg, 6.0kg and the 9.0kg. Larger wheeled units are available for bigger applications. 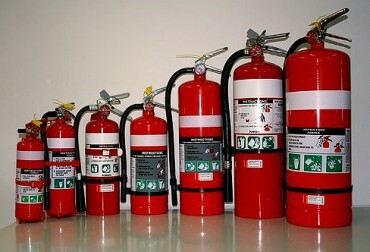 It is always recommended that the extinguisher you buy regardless of which type, is approved by Standards Australia. COME AND SEE US AT LONDON FIRE & SAFE FOR ALL YOUR FIRE EXTINGUISHER NEEDS. © 2014 London Fire & Safe Pty Ltd. All Rights Reserved.